I've always tried to buy products made in America. Sometimes it isn't easy, especially when it comes to tennis shoes. When I heard that our Hypocrite-In-Chief was launching a "Made in America" messaging campaign I laughed so hard my false teeth rattled! Trump wants Americans to buy stuff made here, but that message is somewhat murky when you consider that his daughter Ivanka's whole fashion line is made in China, and that Trump himself has 89 patents for products to be made in China. 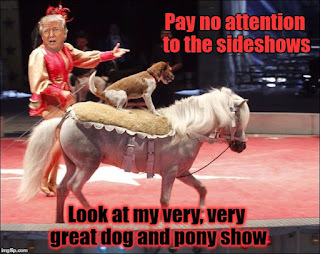 In the next three weeks Trump will be staging dog-and-pony shows looking for good optics. Understandable when you consider recent White House optics. This week will feature products made in the good old USA. Next week is "America Heroes" week that is expected to focus on American jobs. And the third week will be devoted to the "American Dream" according to a White House official. Trump's first dog-and-pony show is happening today. He's looking at locally made products displayed on the South Lawn of the White House. This whole campaign will underscore Trump's plan to reform the tax code. Now there's a scary thought. Who do you think will benefit the most by a revised tax code? Trump's billionaire buddies without a doubt. Despite repeated requests, Trump won't talk about his product patents in China, or Ivanka's clothes and shoes produced there in sweat shops. In a feeble attempt to divert from the Russian collusion scandal - which is really heating up with Donny Jr.s special meeting with the Russians - Trump is hoping to get people's minds on another subject. Good luck. Trump's dog-and-pony shows don't stand a chance against the constant flow of information about his cronies colluding with the Russians during the elections..now that's entertainment!